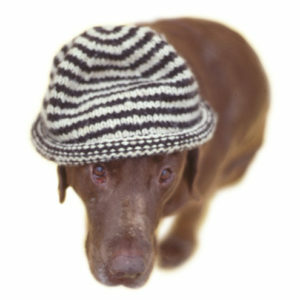 I enjoy designing and making quality products for dogs and working with skilled crafters as well. My little start-up began selling tube scarves for dogs and then expanded with the “My Favorite Sweater” design. Over a decade ago, I was staring at one of my old cotton crewneck sweaters thinking, “there’s a dog sweater in here somewhere.” Not seeing anything I had envisioned anywhere, I worked with a knitter in Maine to create a cotton sweater I wanted to sell. We went over several iterations until I was happy with the results. Now I work with a skilled knitter closer to home, and we have reworked the sweater for a better fit with new colors and yarns. I’ve always loved the idea of tubed scarves as well. I was inspired by a fleece tube scarf I used to wear eons ago. During the time I was figuring out the sweater, I sat at my sewing machine and came up with a reversible design with a pocket. I also wanted to provide knitted ones, so I worked with knitters to help me get those designs in motion. Today, I’m happy to offer both types of tubes. I reintroduced myself to the camping experience a few years ago, and Betty, our frenchie, has always been our little happy camper. I was inspired by our love of the outdoors when creating the HAPPY CAMPER product line including bandanas and reversible tubes for dogs and tees for their people. The homebody in me inspired the COMFY line including knitted sweaters and scarves for ultimate coziness. Happy campers keeping comfy! That cute little black frenchie with the glow-in-the-dark, white-striped face is Betty, and has been my sidekick for 11 years. She is tiny and full of personality. Years ago when I moved to San Diego from Washington DC with my chocolate lab, Zoey, aka chocolate peanut, I met a German shorthaired pointer who I fell in love with. Unlike the outgoing, fun-loving lab, this little GSP was timid, clingy, and pretty much antisocial. I bonded with her. We took a “growl” class together where I learned more from her than anything else and was able to understand the dynamics of pack behavior. She lived a short time due to cancer. Once I moved to Connecticut years later, Zoey, 12 years old at the time, was diagnosed with congestive heart failure, her ongoing seizures were exacerbated by her failing heart. On a cold, snowy day just before Thanksgiving, I had to say good-bye to her. The house was extremely quiet. The silence was unbearable and almost too loud. A few months later, I decided I wanted to get another GSP, and long story short, I got two of them months apart. One in particular, Cali, had talent in the field and in the show ring, and it was a privilege to work with her and also learn from her. In my experience, shorthairs are extremely intelligent, loyal, and want to please, but with that comes a quirkiness—and not always a good one—that comes with many within the breed. 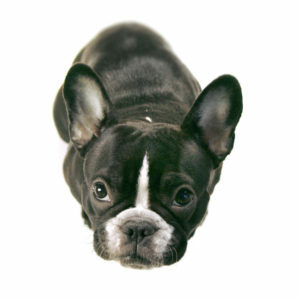 Then the frenchies came along—easy-going little teddy bear-like creatures. I was so hesitant at first due to having two shorthairs in the house, but I was quickly convinced when the first one joined the pack. A fun-loving little boy, he was such a treat to have around, and then a few months later his half-sister, Betty, came on board. I moved to Rhode Island a few years later. For a while now, my little Betty has been my only child—riding shotgun almost everywhere I go and always in my arms. Just recently, Luke, a 15 month-old Hungarian import, came on board. It was through one of those crazy serendipitous moments that he found a forever home with me. CHOCOLATE PEANUT was a nickname for my chocolate labrador, Zoey. She was my inspiration for the site 18 years ago. After graduating from college in 1989, I moved to Washington, DC to start a new journey. In the spring of 1990, I brought my handful of chocolate from North Carolina (where I’m from) to DC where we would be navigating big city life together. I used to take her everywhere—the farmers market, cafés, dog parks, and a few dog-friendly stores. She loved dragging me everywhere, but it was jogging our favorite routes in Georgetown, along the Potomac and the monuments, or Connecticut Avenue where she and I were in sync together. As she grew older, her health was precarious. I did everything possible to keep my Peanut with me just one more day, and I’m convinced that I did. I dodged lumps and bumps that weren’t always benign, seizures of the worst kind, and whatever medical emergency there was, I conquered them, but I couldn’t win the battle against a failing heart. 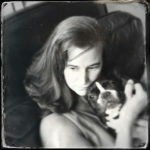 She died in my arms of congestive heart failure the day before Thanksgiving 2002. She was 12 years young. My father’s words comforted me in that I was chosen to be with her—a gift. She was always being photographed, and after one release of the shutter, she would walk off of the set dragging props and lights with her. She appears on the cover of a photo-documentary on animal-assisted therapy that I published in 2000. She was truly a testament of the therapeutic value a dog can give. Her exuberence for life amazed me, and now I’m blessed with the spirit of her memory. She wore a knitted cap and tube scarf like no one else, and that inspired me to create apparel for dogs and their people. The site has been around for a while offering “My favorite sweater” as well as knitted and sewn scarves, but I’m excited to showcase the next generation of chocolatepeanut.com with improved designs and more choices. I’m constantly thinking of new items to produce that are original—putting the fun in functional. Thank you for visiting the site, and I hope you find something here that you and your dog will enjoy. We are a small, boutique shop with big dreams. Share a photo of your dog wearing our apparel at Facebook.com/chocolatepeanut or on Instagram using the hashtag #thechocolatepeanut or tag us @thechocolatepeanut.